It’s the Wednesday before Thanksgiving, and you’ve finally finished all of your errands. Turkey, check. Wine, check. You’ve got everything from the appetizers, to the stuffing and cranberry sauce to desserts covered. Time to call it a night and relax before the big day. The table. You forgot to think of a fun setting! 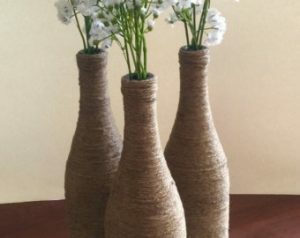 You were planning on using something other than the same boring vases and candles you use for every occasion. Thankfully, you can create your own with few materials needed. And if you’re a wine-o like me, those bottles you keep forgetting to recycle will come in handy. To take off the label, soak in hot water first. This allows the label to peel off easier, or you can scrub it off with a sponge. Simply cover the bottle in glue or wrap in double-sided tape. Start from the top, and neatly spiral all the way down to the bottom of the bottle. Throw in your flowers or berries. 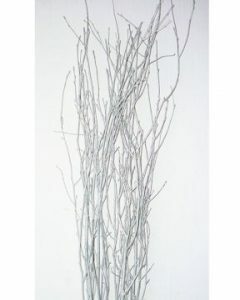 Extra Tip – Spray paint some small twigs and branches a silver or gold finish. Combine these with the berries or flowers (they look good alone too!) And make sure to keep these around until after Christmas! Reading this at 9 PM on a Sunday and the store you ran to doesn’t have twine? 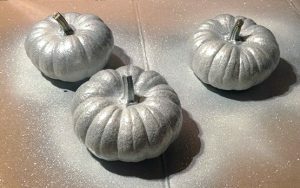 If you can only get your hands on some spray paint, simply spray paint the bottles silver, gold, and other festive colors. 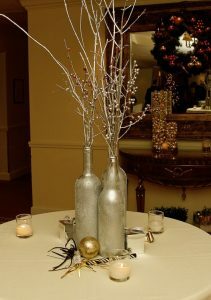 The bottles look fabulous painted the same color as the branches! Slowly feed the lights into the bottle (this will take precision and patience) until full. Wedge the cork in, and voilà! 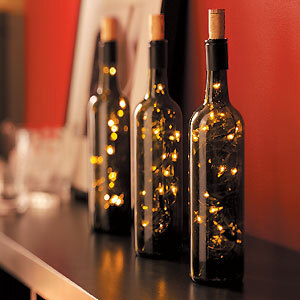 These easy centerpieces will light up any table. And after the day is over, put these in the window for added holiday charm. 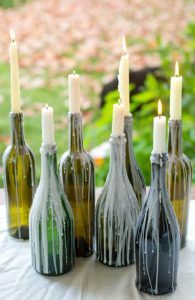 Wedge some candle sticks into the spout of the wine bottles (you may have to shave some of the wax off at the bottom to fit into the bottle) and let burn for several hours so wax paints the bottle. Make sure you put something down underneath the bottles for the wax trickle down on to. Have some extra pumpkins lying around from Halloween? 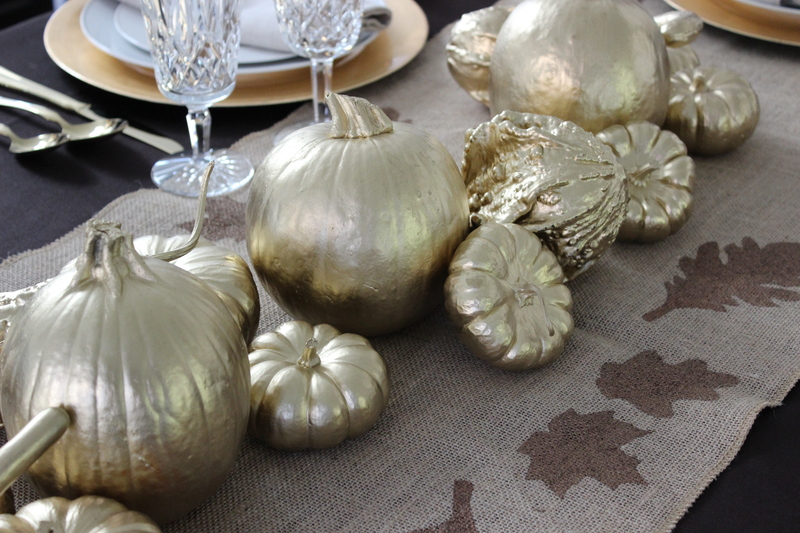 Use silver and gold spray paint to cover the pumpkins in, and place next to any of these DIY vases. Now you have the perfect Thanksgiving Dinner planned. May you receive more compliments than your sister-in-law got for her Easter Brunch. 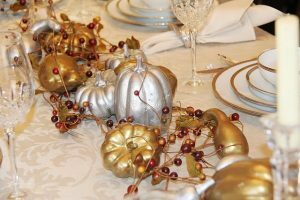 This entry was posted in Uncategorized and tagged DIY Thanksgiving Centerpieces, Thanksgiving Wine. Bookmark the permalink.